Ever wonder why giraffes have dark purple tongues or why lions sleep so much? Jody Thigpen can tell you all sorts of random animal facts when she’s not busy choreographing for her Diva Pop class or the upcoming “Take It Off Broadway” show. Read on to find out how this 27-year-old Center City social worker got hooked on dance and, of course, how she became a walking encyclopedia of animal trivia. Philly Dance Fitness: How did you first get into dancing? Jody: I’ve been dancing since I could walk. I did all styles growing up: jazz, tap, ballet and hip-hop. In high school, one of my dance teachers, who was also the director of a Bollywood company, invited me to perform and tour with them. I was featured on Good Day LA, which was a super fun experience! When I went to college at UC Santa Barbara, I found myself more focused on hip hop. I really enjoyed it, so I decided to explore it more fully and joined a hip hop dance group there. You’ve performed at our student shows before becoming an instructor, and more recently taught routines for Philadelphia Dance Day and the “Take It Off Broadway” show coming up on Sept. 28. Tell us about the piece your students are performing this month. 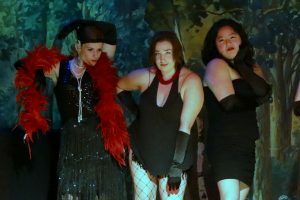 Jody, center, performing “Big Spender” at the debut “Take It Off Broadway” show in November 2017. 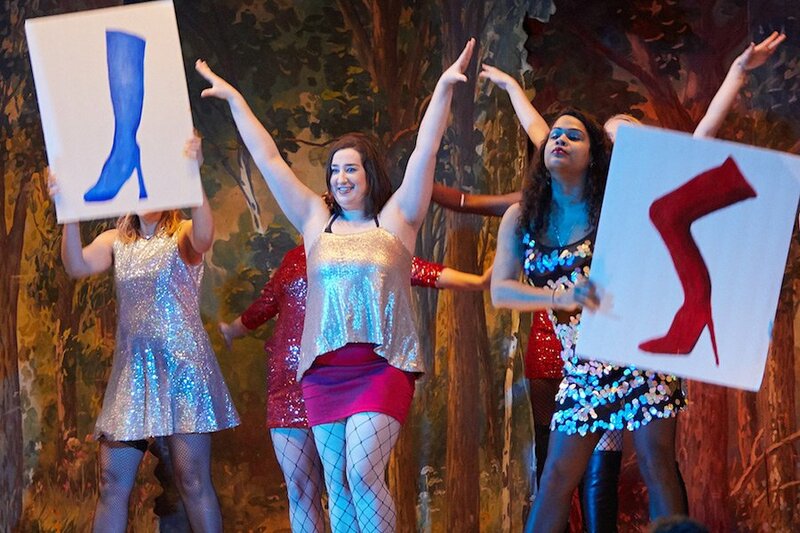 The song I choreographed is “Bend and Snap” from Legally Blonde: The Musical. It’s similar in style to the Pop Jazz class I teach — a lot of sassy, hip choreography. Obviously the “Bend and Snap” move is part of the dance. The routine has a bit of humor and a lot of fun moves. What do you like most about leading routines for our student shows? I love getting to meet new people and share our love of dance! Dance is something that really brings people together. It’s so enjoyable to see my choreography come to life. I never know if what’s in my head will look good on stage, so it’s exciting to see it all come together. This group has been so much fun to work with. It’s also been exciting to see their confidence build as we get closer to the performance. I can’t wait for the show! Describe what Diva Pop is like for those who haven’t been to your weekly class yet. Diva Pop happens every Saturday (or as I like to call it: Sassy Saturday!). We do follow-the-leader routines to popular divas such as Ariana Grande, Ke$ha, Meghan Trainor, Janelle Monae and Beyonce. Then we end with a short, easy routine where we strut our stuff and “own the stage.” All of the routines include hair flips, booty shaking and jazz walks. My goal is for students of all fitness and dance levels to feel strong and powerful by the end of class. I also want them to feel that they’ve worked it out, both in cardio and attitude. Tell us something about yourself that your students might not know. I used to work at the Santa Barbara Zoo all through college, so I know a ton of fun facts about animals. For example, an elephant’s trunk can have up to 100,000 different muscles. And turtle shells are made of keratin, which is the same material in our fingernails. My favorites are about giraffes. They have purple tongues — the darker color protects from sunburn. Also, giraffes only have seven vertebrae in their long necks, which is the same as humans! And they have one of the longest gestation periods — usually pregnant for 15 months! My college job was anything but boring. Come cheer on Jody’s jazz dancers along with several other Philly Dance Fitness student and staff performers at the Take It Off Broadway show on September 28 at the Ruba Club, 416 Green Street. Doors at 8, show at 9 p.m. Click here for tickets. Come early to get a good seat because this show is known to sell out!